According to Nick Watson, Janus Henderson multi-asset team, from a markets perspective, Trump’s ability to provide the US economy and markets with further levels of stimulus and acceleration are likely to be constrained over the next two years. As broadly expected by politicians, polling agencies and markets, the Republicans held onto control in the Senate and the Democrats have taken control of the House. The Democrats were always facing a huge uphill battle to win back control of the Senate, as just 35 seats were up for re-election and the vast majority (26 of the 35) were already in Democrat hands. In fact the Republicans are expected to marginally improve on their current 51-49 majority in the Senate. So what are the practical implications? With control of the Senate, Trump will be able to get confirmation of any executive or judicial appointments. However any legislative agenda will become challenging, for example the building of the wall on the Mexico border. Additional fiscal stimulus and tax cuts will also be unlikely. It also gives the Democrats a platform to hold the conduct of the Trump administration to account. Impeachment is off the table (for now!). 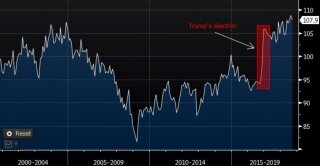 From a markets perspective, Trump’s ability to provide the US economy and markets with further levels of stimulus and acceleration are likely to be constrained over the next two years. His tax cuts and pro cyclical fiscal expansion has certainly boosted economic activity and markets – see below the parabolic and then sustained improvement in NFIB US small business confidence from Trump’s election and then pro S&P 500 agenda. However the split between the Senate and House and the competing agendas of the Republicans and Democrats makes any agreement on further expansionary policies highly unlikely. The pace of economic acceleration has begun to slow in the US recently both in terms of growth and earnings growth, but expansion continues and there are no looming recessionary clouds on the US medium term economic horizon. The split between the House and Senate may at the margin contribute to this modest cooling of the rate of growth, which could reduce slowly building pressures from higher interest rate expectations, rising bond yields and recent USD strength. 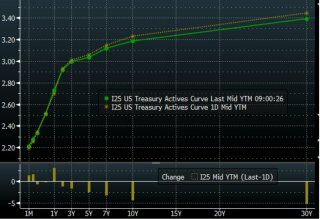 This can be seen at the margin in the US yield curve overnight, where yields have fallen slightly to reflect the potential for less strong growth and a potentially slower pace of interest rate rises. The USD has also been a bit weaker, which could have huge positive implications for EM and Asian equities if the recent USD strength gives way to weakness. None of these moves have been dramatic overnight, but could gain momentum if the pressure on the US accelerator pedal continues to fade. The shift away from the sugary highs of a President fixated on economic data and the level of S&P 500 to a more conventional backdrop is likely to be further emphasised as the US Federal Reserve continues its current pace of interest rate rises, a tightening of monetary policy that is not unreasonable with inflation at target levels and unemployment at 3.7%. I suspect we will hear more criticism from Trump about the Fed going forwards, particularly as he can’t (currently) interfere with monetary policy! Looking further ahead towards the Presidential election in 2020, Trump won’t be able to accelerate economic activity, business confidence or markets to boost support for his re-election campaign. Therefore he may instead double down on areas he can control without input from the Senate and Congress – specifically foreign policy, trade and the level of antagonism from Twitter account. So the overall conclusion is that the mid-term election results appear to be a bit of a non-event. The S&P finished up a bit yesterday while the US 10 Treasury yield has fallen slightly below the 3.2% level. Markets will quickly return their focus back to the trade war between the US and China, with the well trailed meeting between Xi Jinping and Trump at the G20 in Argentina later this month looming on the horizon. The Republicans losing the House does not mean an economic slowdown or market correction, instead we should expect a more conventional late cycle US economy and lower return expectations from US markets. We have also got used to the US dragging all other markets along with it and investors blindly buying dips in the S&P 500 – the next couple of years may be more about non US equities and a more considered approach to taking risk. Therefore unfortunately it is likely to mean more volatility but on a the flip side a greater focus on valuation, fundamentals and diversification, an environment which should present a better environment for stock pickers and asset allocators.